Photograph depicts buildings at various locations in mine: crushing plant (centre?) and what is believed to be the original tramline loading station on left. 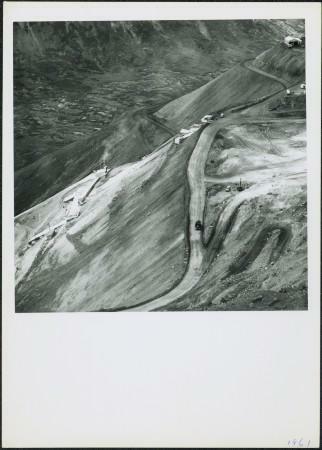 Mine road featured in center, blasthole drill visible near dump truck in midground. Mine valley in background. Photo believed to have been taken from mine's South Peak. Handwritten annotation on verso of photograph: "1961". Item is part of the Cassiar Asbestos Corporation Ltd. fonds. Item is one of 32, see also items 2000.1.1.3.19.1 - 2000.1.1.3.19.32.